This charger fits the Giant Twist models from 2006-2013 and is suitable as a replacement for the NC SSC04GNT. Observe the voltage and charging plug when ordering a bicycle battery charger. Use our helpcenter. 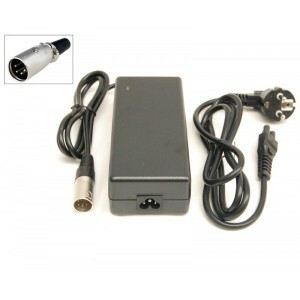 This replacement charger for Giant Twist is suitable for the 26V Sanyo batteries. This charger has an XLR 4 pin / 4 pole connector. Suitable for Giant Twist Comfort CS, Giant Twist Express CS, Giant Twist Sport CS, Giant Twist Comfort CS, Giant Twist Lite Single, Giant Twist, Single, Giant Twist Go Single and Giant Twist Go Double. Binnen 24 uur ontving ik mijn oplader , deze werkt perfect. Bedankt voor de snelle service.